Sparkle Flowers are fun and pretty to decorate with. You could easily color a picture on the paper before you fold or add paint or MORE Glitter when they are done. Have fun! This is great for kids who are able to fold straight lines. Younger kids need more help, but they still enjoy watching the process and helping with the glue and glitter! Fold paper accordion style with about half inch wide folds. Once the whole sheet is folded hold together and fold in the center so that the two ends meet. Cut that open end with one angle or a curve to your liking. Use clear tape to cover the inside fold where it matches up to the other half. Tape just that one open fold to the other. Carefully open the fanned end of the flower. This gave me some trouble and you just have to be gentle with it but not afraid to pull it open. Tape the other two ends together to complete the circle. I also added a line of glue from a glue stick to try to keep the inside together. We cut out a circle of other paper and covered it with glitter for the center. We like glitter around here! I ended up just rolling a piece of masking tape up and double sticking it to the circle and the center of the fanned circle. This was great for a 4 year old who likes folding. I had to pull it open and secure the outside seam for her. The rest she was able to do on her own. It has too high of difficulty for my 3 year old. She enjoyed making glitter circles though. She covered a cut circle with glue and sprinkled on the glitter….we LOVE glitter in my house:) She made many more than we needed for the sparkle flowers so we cut the circle into a spiral hanging ornaments. Enjoyed this so much I put a link on my blog with it and tried one myself. 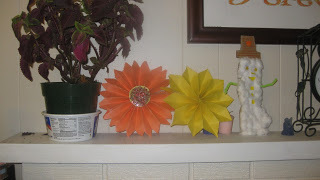 That’s awesome Donna:) We made some to tape to the wall because we liked them so much after making the first one.